Disruption to People's Lives -- From the news, we see that many places are struggling with an abnormally hot summer. One example is Europe where areas normally having temperatures in the twenties Celsius are experiencing temperatures of over thirty degrees. It is really disrupting people's lives because people cannot stay home, as it is too hot and dangerous to stay indoors during daytime. They have to go to public places such as pools and lakes to cool off from the heat. In China, the extremely hot weather is causing a lot of accidents, with vehicle tires bursting from the heat and friction of driving on hot asphalt. When this happens on the highway, it results in very dangerous accidents. Such extreme heat is causing major impact and making life difficult. How are we to cope with such conditions, especially as they will get worse in the coming years due to climate change? Our Part in the Vicious Cycle -- While such heat waves are difficult to bear, are we able to connect the dots and see how we are part of the vicious cycle causing such extreme weather and making things worse? With the fast-growing world population, humankind is tipping the balance of Nature with excessive consumption of electricity, water, and all types of resources. For example, because we want to live in comfort, a lot of products are manufactured. In the manufacturing process, the air, water, and land all get polluted. With many factories around manufacturing all kinds of goods, the pollution gets serious. As we saw in the news, in Taiwan, rice grown in parts of Chiayi County were found to be contaminated by factory wastewater; though very close to harvest, the crops all have to be destroyed because they are not fit for consumption. It's not only the farmers' hard work that all goes to waste—this also means a reduced food supply for us. Think about this, human beings need food and water to survive, but the pollution we have created is damaging our food and water supply. With humankind continuing these polluting activities, the downward spiral will only get worse. This creates major threats for our survival. Our Dangerous Situation and What We Can Do About It -- In fact, following the news in recent years, we already see abnormal weather conditions and disasters happening more frequently and more seriously. With the extreme heat wave, it is so hot that it feels like the hot sun is baking our air, our ground, and everything in our world. Given the intensifying climate changes, the situation is like fast-rotating vehicle tires spinning faster and faster on an ever-increasing hot surface made hotter by the extreme heat—the risk of bursting is looming. How will we survive this danger? What about the future generation? What will they face in their time? The only way we can turn around this situation is if we human beings really reduce our desires and start living more simply. Furthermore, we should reach out to care for our world and all the people in suffering by bringing forth our unconditional love. Tzu Chi volunteers bring us many heartwarming reports; this is because they go into the underprivileged corners of society where people are suffering in silence to provide timely care. Through their love and care, the volunteers are relieving all kinds of pain and suffering in this world. To Act as a Living Bodhisattva -- Now that it is August, when classes will soon begin for children of schooling age, Tzu Chi volunteers in many countries such as Myanmar, the Philippines, and the U.S. are assisting children of low-income families by, for example, giving financial aid, distributing uniforms, or helping to fund school meal programs. 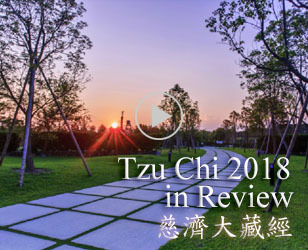 We see that even in a wealthy country like the U.S. there are impoverished families, and Tzu Chi volunteers are helping to look after their needs by acting as real, living bodhisattvas who personally go to these oft-overlooked corners of society to alleviate difficulties and suffering. By doing this, they witness firsthand the difficulties poor people have to cope with and come to realize how their timely aid can make a true difference for the people. It's very important to provide this needed help. To Create a Cycle of Love -- While providing material aid, Tzu Chi volunteers also strive to inspire people's love. They share with people the concept that each of us can help others just by consuming a little less, which will give us extra money that we can donate to help others. In the Philippines, Tzu Chi volunteers have been providing lunch vouchers so impoverished children at twenty schools in San Mateo, Rizal Province can have at least one free lunch per week. But even more importantly, our volunteers hold activities to inspire the better off students not to waste food and to encourage them to put any amount they can daily into a coin bank in their classroom to help feed their less fortunate classmates. Children responded very actively to this call for love and giving. On one hand, this teaches the students about cherishing one's blessings and not being wasteful; on the other, hungry students are provided for because by inspiring the children's love for others and showing them how through joining together, with each giving what he or she can, the majority of students can help the small number of underprivileged children in their class. This is creating a cycle of love and goodness in the classroom that is very precious. To Amass the Power of Love -- Recently, Tzu Chi Malaysia celebrated its 20th anniversary. In these twenty years, our Penang Tzu Chi branch office has aided over 266,000 families. This takes a lot of volunteers working together to give of themselves with love. It is possible all because of an initial thought to help others which was then carried out time and again; over time, with people encouraging one another to volunteer and to carry on this work, this built up a powerful capacity of love, capable of making a difference in so many people's lives and of turning their situation around. Those people in turn were inspired to bring forth their love and to give of themselves. This is how the power of love is amassed. To Survive, We Must Wake Up -- With all the disasters that are happening in the world right now, including destructive floods, massive forest fires, and droughts that are threatening the food and water supply, what can we humans do to survive? Some people talk about "conquering Nature" or "combatting disasters". But is this something humans can in fact do? Look at the severe drought and extreme heat wave in China. When Nature becomes imbalanced, we humans are truly at the mercy of these conditions. The only way to change these problematic climate conditions for the long run is by reducing our consumption in daily life to lower carbon emissions and to conserve the earth's resources. Only by living more simply and frugally can we stop producing such a large amount of carbon emissions and pollution as well as stop depleting natural resources at such a fast rate. We need to think about our future generations; we also have to think ahead to our own future—the comforts we enjoy now will mean hardship in the future. So, we need to wake up to this reality and start living more frugally. We need to quickly make adjustments in our daily living habits. When Nature becomes further imbalanced and brings devastating disasters, it will not be something we human beings can hold up against. So, let us all bring forth our love now to do what we can. All it takes is to reduce and conserve: reduce consumption, conserve resources. A Greater Capacity to Help -- With so many disasters afflicting our world and so many people in hunger and poverty, there really needs to be more bodhisattvas in the world and a bigger and stronger "energy of love" so that the capacity to help will be greater. For example, we see the flooding in Sudan which has taken lives and destroyed homes. It is heartbreaking, but I feel very helpless because we do not have Tzu Chi volunteers nearby who can go to help and there is no way for us to reach the people and bring relief. 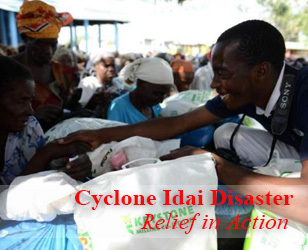 But when flooding happened in Mozambique earlier this year, because there is a Taiwanese woman living in Mozambique who is inspired by Tzu Chi's mission and dedicated herself to building up a local team of volunteers, the disaster affectees were able to receive aid after the disaster. Now, there are more than 100 volunteers locally. So, when the bodhisattva potential in people is brought out, they can serve as a bodhisattvas and bring help to people in need around them. When they give of themselves with honesty and sincerity, such energy of love is infectious. From this, we see that anything is possible when we put our minds to it. At this time, it is very important that we bring out this potential in more people because as the global population grows, there will only be more people suffering hardship as the world's limited resources become more strained. Sharing of Spiritual Riches -- In Africa, we see poor people bringing forth their love to help others and spreading this love and way of caring to more people. They show us that all people, no matter rich or poor, can do this if they have the seed of love in their hearts, and that this will give them spiritual riches which are more empowering than an abundant supply of material assets. Recently, our Zulu volunteers from South Africa, who despite being poor themselves have been caring for AIDS patients and AIDS orphans in their community for years, went to Mozambique to guide the more than one hundred newly inspired local volunteers in carrying out a rice distribution. They had to overcome many difficulties. Firstly, working with the government to win their trust and cooperation was not easy. With no diplomatic relationship between Taiwan and Mozambique and with no one knowing about Tzu Chi there, obtaining a government permit to receive aid supplies sent from Taiwan and host public gatherings for distribution took numerous outreaches to persuade key decision makers. Secondly, with supplies being limited, our volunteers needed to bring the entire community on board with the final selection of aid recipients in order to avoid disorder breaking out at the distribution site due to people being disgruntled at not receiving aid. 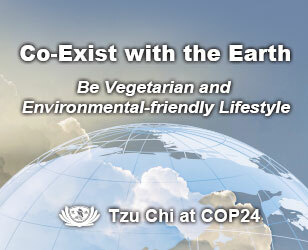 Thirdly, the distribution had to be conducted in line with Tzu Chi's values and spirit, so careful planning was needed. Sharing with these new local volunteers about the need to carry out the distribution with gratitude and respect for the recipients, the South Africa volunteers guided them to arrange the rice in neat stacks and to organize people in orderly lines so the distribution could be carried out in a very smooth and orderly way, with loving care and respect for the people's dignity. When handing over the rice, the volunteers all bowed deeply and thanked the recipients, and the recipients likewise bowed in thanks when receiving the rice. A local government official in attendance was impressed by the good manners shown by all and the kind and respectful interactions taking place thanks to Tzu Chi volunteers' influence, and even asked Tzu Chi volunteers if they could come often to continue guiding the local community residents to care for one another and treat each other with love and courtesy. From this, we can see that when we sincerely give of ourselves with genuine love, it can touch people's hearts. Our volunteers in Africa also show us that as long as we have love in our hearts, our lack of resources will not be obstacles for us, and we can still lead very happy, rich lives because love empowers us with unlimited potential and has filled our heart with spiritual riches. This is why Tzu Chi volunteers not only do charitable work but most importantly, go into the community to plant the seed of love in people's hearts. In Africa, we see seeds of love already sprouting and continuing to be spread widely. This is how one seed can give rise to innumerable others. When the energy of love inspires and uplifts the entire society—this is where true hope comes from. Time flies by so quickly. In the blink of an eye, life can take many turns—so many circumstances are uncertain and unpredictable. Amidst this reality, we should first practice centering our mind without giving rise to afflictions or creating impurities within it. Next, we should know our responsibilities and live our life accordingly. This is the way to a peaceful and good life. Losing Peace -- My heart is heavy seeing the violent protests and riots in Egypt, which have plunged the country into social turmoil all because of differences in opinion over who should be president. People are dying, families broken. It's a case where people, losing steadiness and peacefulness of heart, act out and create disorder in society, thus creating new hardship and suffering for many people. This is such a deeply regrettable situation. Is what people are agitating for really the important issue in life? What really creates blessings and a good life? Actually, it is peace. We should work to maintain a peaceful and balanced Mother Nature with favorable weather that helps crops grow well. Also, it is important to have a peaceful society in which people can gain a better life if they work hard and make their contribution. But, this can only happen if the people of a country steady their hearts and minds and peacefully carry out their responsibilities. Only then can there be the peace, stability, and security in society to make a good life possible. So, every one of us really needs to work on maintaining steadiness and peacefulness of heart. We mustn't let the slightest of issues set off anger and violence, for this can lead to very regrettable situations in our society. Whether we can have a good life depends on whether we can stabilize our hearts and minds. Finding Peace and Security -- By comparison, look at the poor people in Paraguay whom local Tzu Chi volunteers recently went to aid. Though life is hard, they accept their life conditions and carry on their roles and responsibilities in the community. When Tzu Chi volunteers brought doctors to give them the medical treatment they needed and distributed gifts of new uniforms, supplies, and shoes to children in time for the start of school, their hearts were warmed by this love and support and they were very content and grateful. They don't ask for much. The children, having received shoes for school from Tzu Chi, were already very happy and promised to work hard at their studies. Look at these people living in poverty—though materially they do not have much, yet because they are grateful and content, they have peace and security. Then, with continued support from kindhearted members of society, they can still go about their lives and their children can grow up safe and sound to one day become contributing members of society.